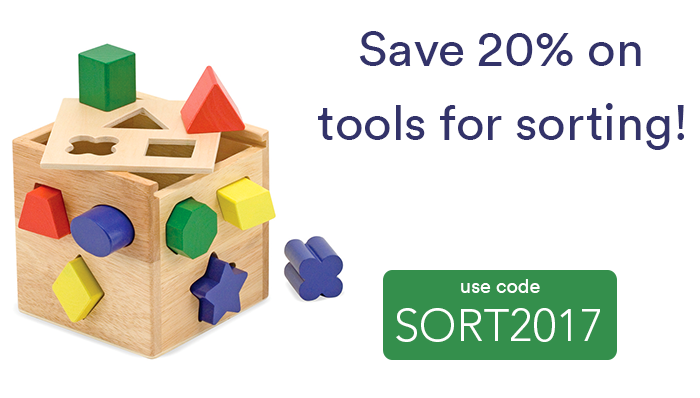 Pick of the Week: Take 20% off Super Sorting Tools! Develop your learner’s sorting and matching skills with these tools and manipulatives! Read and re-enact classic children’s stories with charming 3-D objects! This week, we’re offering 15% off our new collection of 3-D Storybooks. Just apply our promo code 3DSTORIES at check-out! These classic storybooks represent some of the finest children’s literature available. Each set includes the book, plus a carefully selected set of charming manipulatives to help young students retell and re-enact these wonderful stories in their own words. If You Give a Mouse a Cookie includes everything you will need to feed and take care of this very energetic mouse! A favorite, Goodnight Moon comes with a sturdy paperboard room to create your own diorama with accompanying animal manipulatives and a furniture set! 1, 2, 3 to the Zoo will make counting fun for younger children! This set comes with 56 animals, plus number tiles to make 1–10. Don’t forget to apply our promo code 3DSTORIES when you check out online or over the phone to take 15% off any of these three great 3-D storybooks! 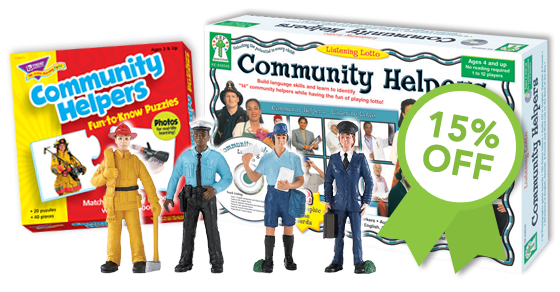 Understanding who important community helpers are and their roles in the community is vital to daily living skills in students with autism. This week, we’ve compiled all of our best tools for teaching your students about people and their occupations, including their tools of the trade. You can also save 15% on any of these sale items by using our promo code NEIGHBORS at check-out! View our entire sale here. *Offer is valid through March 29, 2016 at 11:59pm EST. Not compatible with any other offers. Be sure there are no spaces or dashes in your code NEIGHBORS at check-out. Call us at (800) 853-1057 with any inquiries. Inchimals Animal Blocks are a fun and effective way to teach measurement, number concept, addition, subtraction, and pre-algebra to children of many ages. Beautifully crafted, Inchimals contains 12 wooden animal blocks measuring anywhere from 1 inch (the tiny ladybug) to 12 inches (the towering giraffe). 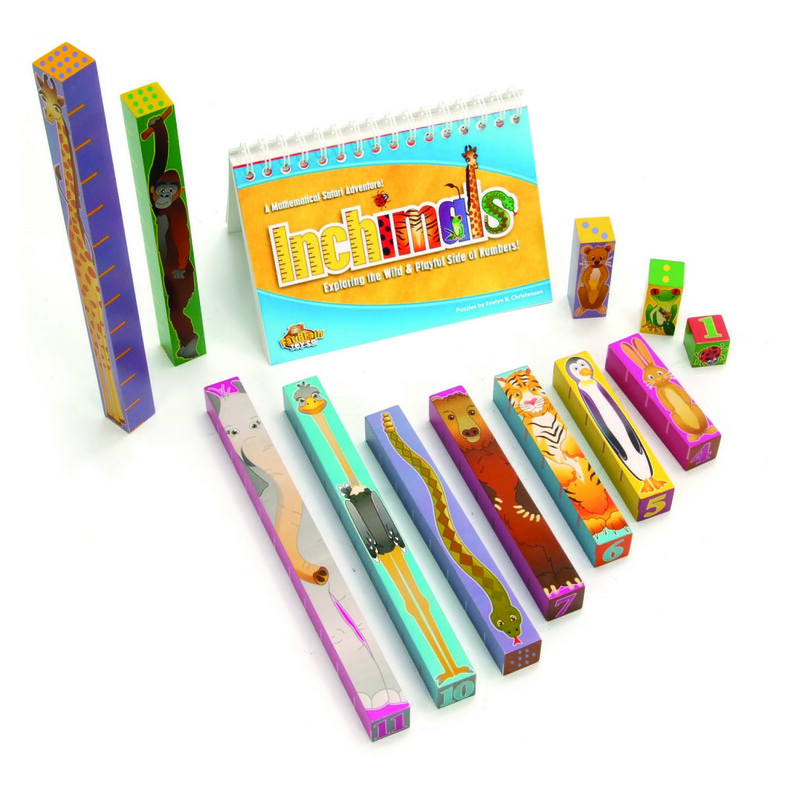 This week, take 15% off your order of the Inchimals by entering in our promo code INCHIMALS at check-out. With exact inch segments, written numerals, representative dots, and cute animals, Inchimals is a multi-purpose toy that encourages creativity, interaction, logic and mathematics mastery. *Offer is valid for one-time use through March 8, 2016 at 11:59pm EST. Promotion does not apply to past purchases. Be sure there are no spaces or dashes in your code INCHIMALS at check-out. 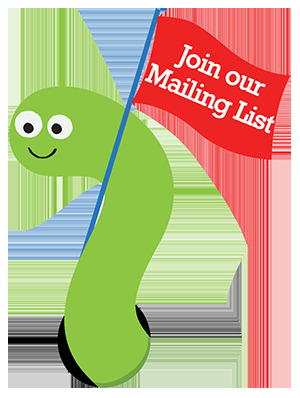 Call our friendly customer service team at (800) 853-1057 with any inquiries. Teach early number skills, colors, shapes, and sorting skills with this fruity Super Sorting Pie! The pie also comes with sorting cards that can be placed in the bottom of the pan to provide visual cues for students. This week, save 15% on your order of the Super Sorting Pie and start sorting! Use our promo code PIE15 at check-out to redeem these savings. The top crust also becomes a nifty bowl to conveniently hold the fruit counters. Students can also practice fine motor skills and hand-eye coordination with the included tweezers. The set comes with 60 counters (7 fruits in 5 different colors), 1 plastic pie plate with a cover & removable divider, 3 double-sided sorting cards, 2 jumbo tweezers, and an Activity Guide for suggested lessons. The Super Sorting Pie measures 8¾ inches in diameter. Take 15%* off your order of the Super Sorting Pie this week with discount code PIE15 at check-out! *Offer is valid for one-time use only through January 19, 2016 at 11:59pm EST. Be sure there are no spaces or dashes in your code PIE15 at check-out! Contact our friendly staff at (800) 853-1057 with any inquiries. Around the holidays, parents often get calls from grandparents, friends and relatives asking for gift ideas for children with special needs. 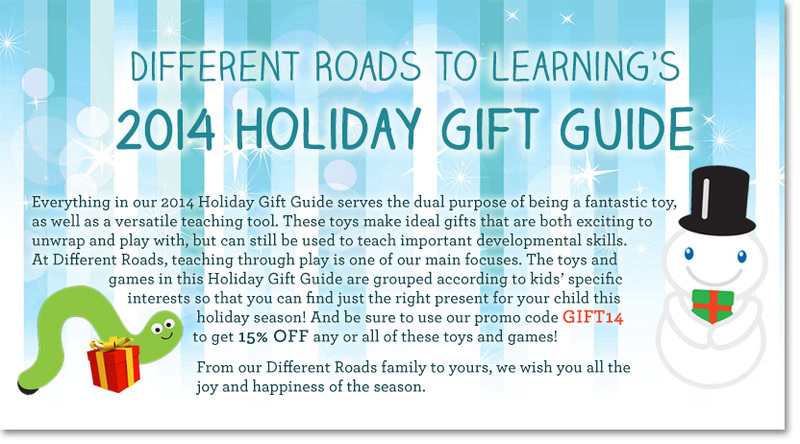 Our 2014 Holiday Gift Guide will make it a bit easier for everyone to find something special for the special child in their life. Our trusted consultant Sam Blanco, MSEd, BCBA has put together some of her favorites that are sure to bring delight. From our Different Roads family to yours, we wish you all the joy and happiness of the season. DOWNLOAD OUR 2014 HOLIDAY GIFT GUIDE NOW! AND we’re slashing the prices of the toys and games in our Holiday Gift Guide, so be sure to apply or mention our promo code GIFT14 to save 15%* on these featured products! A playful world of math learning awaits in the all-new Tiggly Counts! 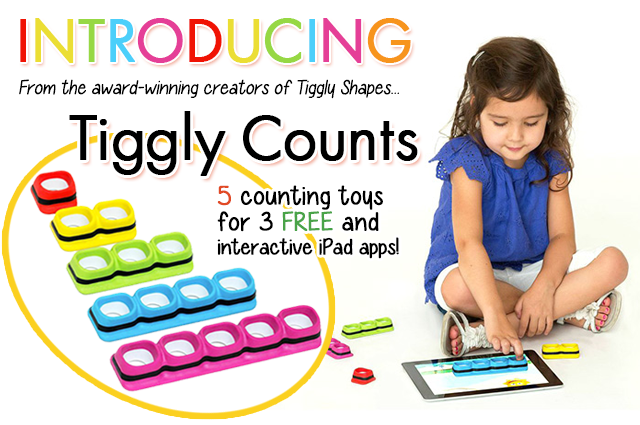 From the award-winning makers of Tiggly Shapes, Tiggly Counts is a set of 5 counting toys that interact with 3 free iPad apps to connect children to a playful world of math learning. The apps and manipulatives work in tandem to develop a child’s number sense, counting skills, understanding of math operations, and more. The 3 free apps include Tiggly Chef, Tiggly Cardtoons, and Tiggly Addventure, and introduce children to a wonderful world of lovable characters that surprise and delight, as they learn essential early math abilities. Designed for children ages 3 and up. Introduce early math to your students with this vibrant set of 1 to 10 Counting Cans. These cans depict and contain 1 to 10 kinds of colorful fruits and vegetables for your young learner to practice counting, number recognition, and sorting. This week only, save 15% on your order of the 1 to 10 Counting Cans for by entering in our promotional code COUNT10 at checkout! Children will also be able to expand their knowledge of a variety of fruits and vegetables that are typically not found in other play food manipulatives. This set of 55 plastic fruits and vegetables will reinforce everyday vocabulary, fine motor skills, and number sense in learners in grades pre-K and up. Each can measures 3 by 4.25 inches. Don’t forget — this week only, you can get your own set of the 1 to 10 Counting Cans for $39.91 reduced from $46.95 by using code COUNT10 at checkout. *Offer valid until Feb. 4, 2014 at 11:59pm EST. Not compatible with any other offer. Be sure there are no spaces or dashes in the code at checkout! We’re thrilled to introduce this brand new Fidgets Kit, exclusively created and brought to you by Different Roads in conjunction with our Behavioral Consultant Stacy Asay. Fidget toys can be a great and socially acceptable replacement for stereotypic or repetitive behavior in the classroom or community. Some students find the repetitive action of “fidgeting” to be calming and are then better able to focus on the task at hand. Additionally, some students who have a difficult time staying still are able to sustain sitting behavior for longer periods with less support or prompting when they are manipulating something repeatedly in their hands. In honor of the arrival of this great new kit, this week only, take 15% off of the Fidgets Kit by entering in our promotional code FIDGETS at checkout! We’ve assembled this Fidgets Kit to include an array of items that can provide a variety of sensory experiences: stretchy, chewy, spiky, twisty, bumpy, twisty, clicky, bouncy and smooshy! We’ve included a variety of items that vary in texture or are manipulated in different ways so that they can be rotated regularly. The components have also been chosen so that they can be worn on the wrist, clipped to a belt, handheld, or attached to a piece of clothing. Remember, this week only, take 15% off* your order of the Fidgets Kit by applying FIDGETS at checkout! *Offer valid through 01/28/14 at 11:59pm EST. Not valid with any other offer. Be sure there are no spaces or dashes in the code at checkout!